There are few designers who evoke a powerful cerebral ethos to their designs. 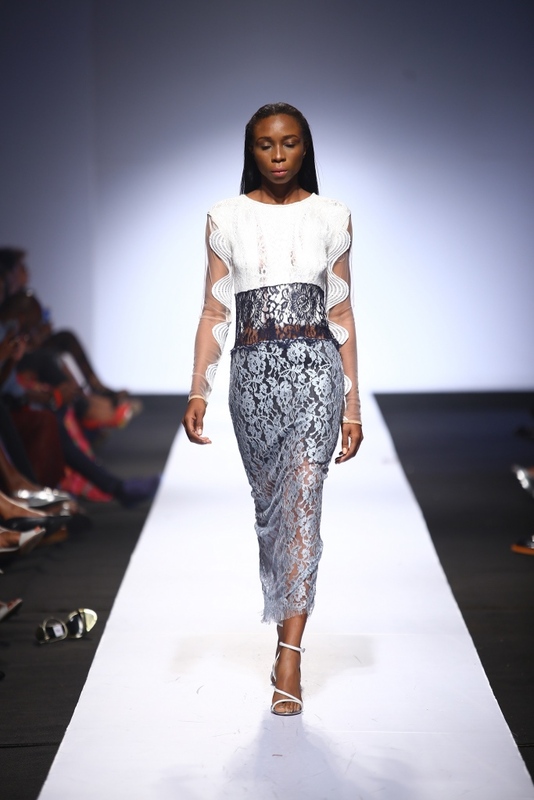 Amaka Osakwe of Maki-Oh is one of them and her latest outing at the 2015 Lagos Fashion and Design Week has everyone singing praises. Maki-Oh means business both literally and figuratively. Literally, “Osakwe was thinking about Sisyphus and Camus’s quote, “Our life is built on the hope for tomorrow, yet tomorrow brings us closer to death,” and the Almodóvar film Talk to Her and the karuwai courtesans of northern Nigeria were bouncing around Osakwe’s headspace as well, making for a rich brew.” Figuratively, her work with Adire are always bright and in lively hues, which if you look closely, some are tear drops prints, and when you peer inside the tears, reveal an underprint of delicate flowers. 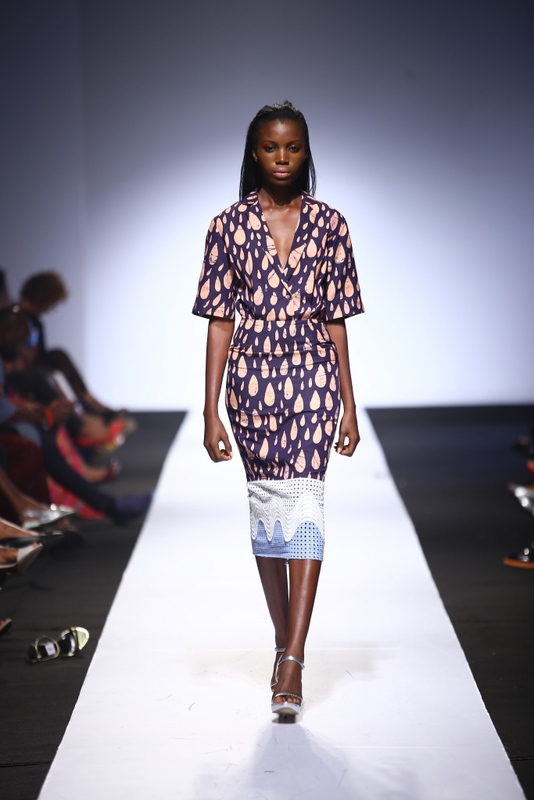 This collection had a “philosophical weight one doesn’t often discover in clothes.” But then again, it’s Maki-Oh and this is why people from the the Flotus to everyday citizens have come to love everything she does. Her worked with strong, multi colors: blue, turquoise, raspberry pink was brilliant. 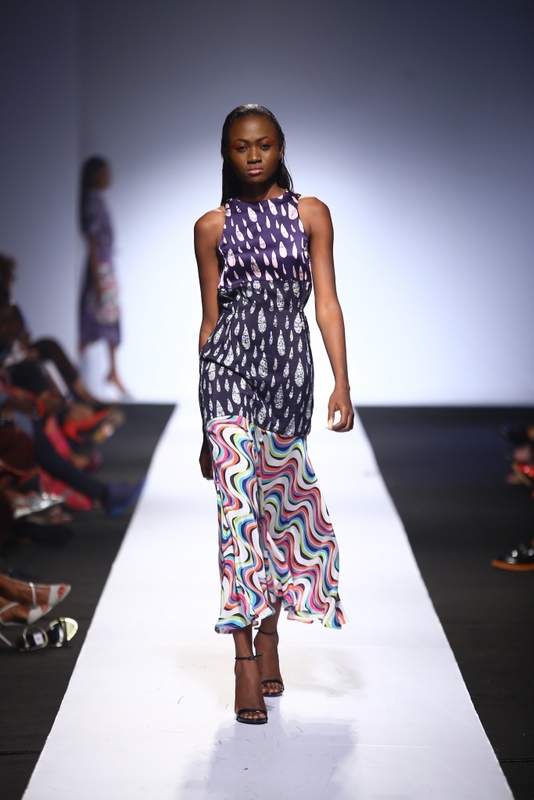 Most of her collection appeared in a bold abstract print or monochrome colors, with terrific detailing such as scalloped edges, thread embroidery, graphic appliqué, feathers, fringe,and lush mesh. She also added visual illusions and audacious mismatching that were totally chic and quite refreshingly delicious to behold. 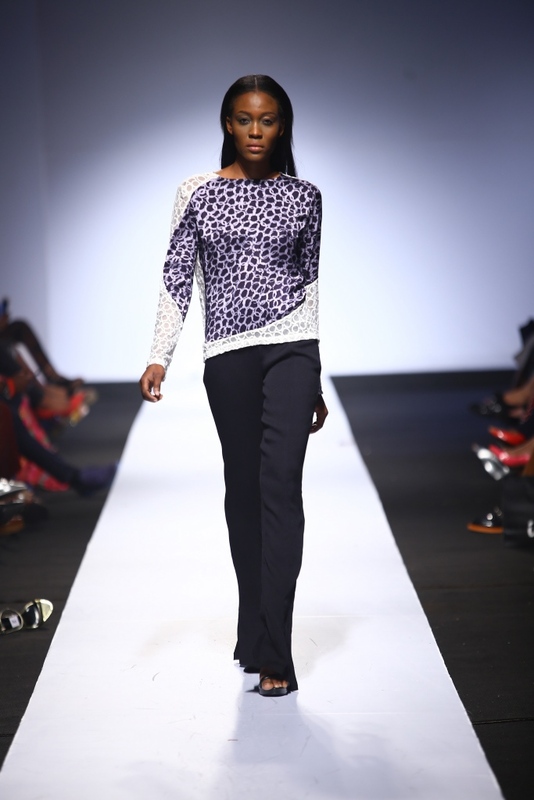 Then, came two bold pieces that are simple, yet powerful in execution. This relaxed, ruffled dress of geometric black broderie anglaise, are my favorite of the night. I get it Maki-Oh, life is too short and if your are going to be dressed in anything, why not wear something that evokes the power of womanhood. 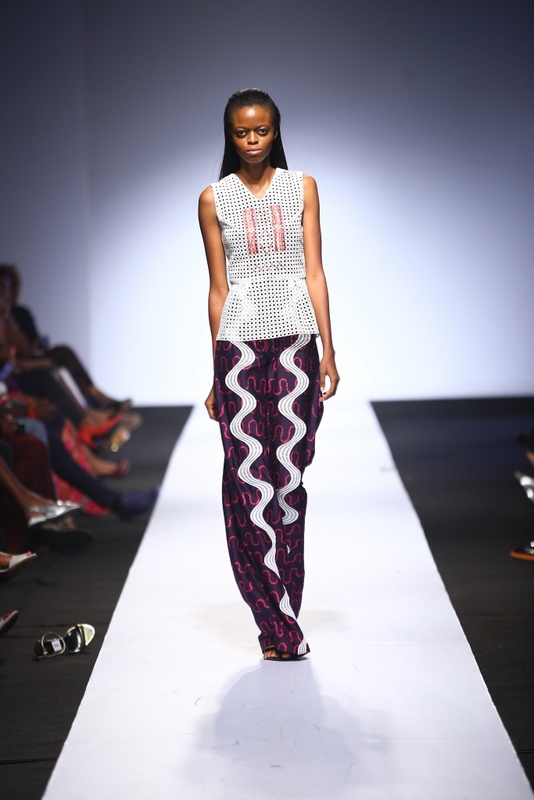 African fashion today has many hurdles. Maki-Oh may be right to stand aside from the rest. 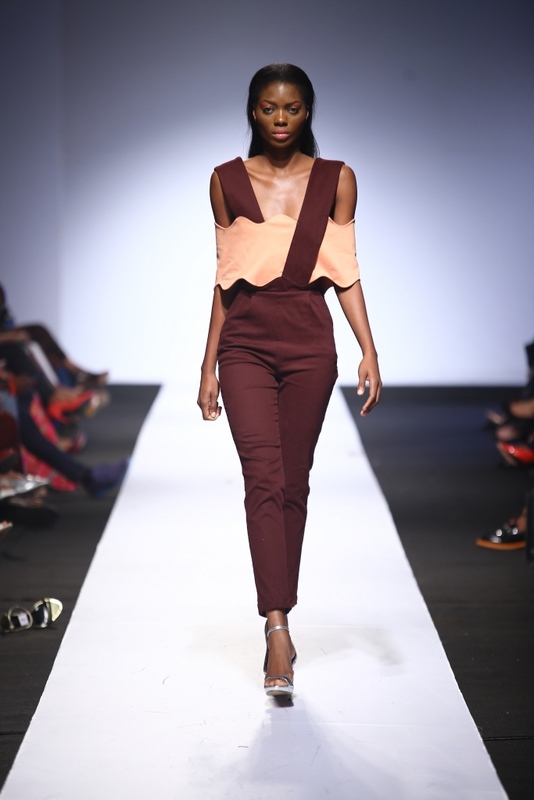 She did so at Lagos Fashion and Design Week, with a show that was streamlined and sophisticated.